Last year in September, upgrades of the gravitational wave interferometer LIGO were completed. 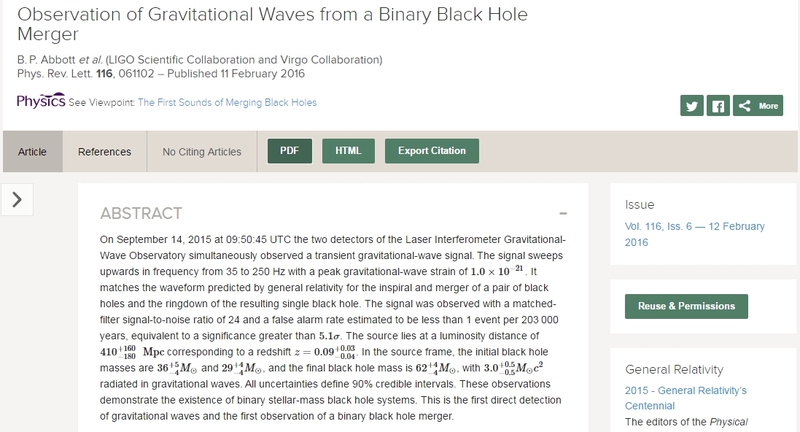 The experiment – now named advanced LIGO – searches for gravitational waves emitted in the merger of two black holes. Such a merger signal should fall straight into advanced LIGOs reach. It was thus expected that the upgraded experiment either sees something immediately, or we’ve gotten something terribly wrong. And indeed, rumors about a positive detection started to appear almost immediately after the upgrade. But it wasn’t until this week that the LIGO collaboration announced several press-conferences in the USA and Europe, scheduled for tomorrow, Thursday Feb 11, at 3:30pm GMT. So something big is going to hit the headlines tomorrow, and here are the essentials that you need to know. Gravitational waves are periodic distortions of space-time. They alter distance ratios for orthogonal directions. An interferometer works by using lasers to measure and compare orthogonal distances very precisely, thus it picks up even the tiniest space-time deformations. Electromagnetic waves travel in space-time, whereas gravitational waves are a disturbance of space-time itself. Electromagnetic waves have spin 1, gravitational waves have spin two. The spin counts how much you have to rotate the wave for it to come back onto itself. For the electromagnetic fields that’s one full rotation, for the gravitational field it’s only half a rotation. The dominant electromagnetic emission comes from the dipole moment (normally used eg for transmitter antennae), but gravitational waves have no dipole moment (a consequence of momentum conservation). It’s instead the quadrupole emission that is leading. If you keep these differences in mind, you can understand gravitational waves in much the same way as electromagnetic waves. They can exist at any wavelength. They move at the speed of light. How many there are at a given wavelength depends on how many processes there are to produce them. The known processes give rise to the distribution in the graphic above. A gravitational wave detector is basically an antenna tuned in to a particularly promising frequency. Since all matter gravitates, the motion of matter generically creates gravitational waves. Every time you move, you create gravitational waves, lots of them. These are, however, so weak that they are impossible to measure. The gravitational waves that LIGO is looking for come from the most violent events in the universe that we know of: black hole mergers. In these events, space-time gets distorted dramatically as the two black holes join to one, leading to significant emission of gravitational waves. This combined system later settles with a characteristic “ringdown” into a new stable state. Yes, this also means that these gravitational waves go right through you and distort you oh-so-slightly on their way. The wave-lengths of gravitational waves emitted in such merger events are typically of the same order as the dimension of the system. That is, for black holes with masses between 10 and 100 times the solar mass, wavelengths are typically a hundred to a thousand km – right in the range that LIGO is most sensitive. If you want to score extra points when discussing the headlines we expect tomorrow, learn how to pronounce Fabry–Pérot. This is a method for bouncing back light-signals in interferometer arms several times before making the measurments, which effectively increases the armlength. This is why LIGO is sensitive in a wavelength regime far longer than its actual arm length of about 2-4 km. And don’t call them gravity waves. A gravity wave is a cloud phenomenon. Gravitational waves were predicted a hundred years ago as one of the consequences of Einstein’s theory of General Relativity. Their existence has since been indirectly confirmed because gravitational wave emission leads to energy loss, which has the consequence that two stars which orbit around a common center speed up over the course of time. This has been observed and was awarded the Nobel Prize for physics in 1993. If LIGO has detected the sought-after signal, it would not be the first detection, but the first direct detection. Interestingly, even though it was long known that black hole mergers would emit gravitational waves, it wasn’t until computing power had increased sufficiently that precise predictions became possible. So it’s not like experiment is all that far behind theory on that one. General Relativity, though often praised for its beauty, does leave you with one nasty set of equations that in most cases cannot be solved analytically and computer simulations become necessary. The existence of gravitational waves is not doubted by anyone in the physics community, or at least not by anybody I have met. This is for good reasons: On the experimental side there is the indirect evidence, and on the theoretical side there is the difficulty of making any theory of gravity work that does not have gravitational waves. But the direct detection of gravitational waves would be tremendously exciting because it opens our eyes to an entirely new view on the universe. Hundreds of millions of years ago, a primitive form of life crawled out of the water on planet Earth and opened their eyes to see, for the first time, the light of the stars. Detecting gravitational waves is a momentous event just like this – it’s the first time we can receive signals that were previously entirely hidden from us, revealing an entirely new layer of reality. So bookmark the webcast page and mark your calendar for tomorrow 3:30 GMT – it might enter the history books. Update Feb 11: The rumors were all true. They have a 5.1 σ signal of a binary black hole merger. The paper is published in PRL, here is the abstract. "A gravity wave is a cloud phenomenon." Yes, but most people are probably familiar with gravity waves in the form of ocean waves. In a gravity wave, the restoring force is gravity. In short-wavelength waves, the restoring force is surface tension. (Of course, both are always present; the question is which is dominant.) Almost all water waves of appreciable size are gravity waves, whatever their source (wind, earthquake (tsunami), tides). Either way, they don't have nothing to do with gravitational waves. Can anybody tell me some good German words for "gravity and gravitational waves"? A black hole, of course, is a "schwarzes Loch". My comment is about this sentence: "It was thus expected that the upgraded experiment either sees something immediately, or we’ve gotten something terribly wrong." I don't think the expectations should be described as this optimistic - a null result in the first observing run doesn't imply that the astrophysical rates OR general relativity need to be re-evaluated. In fact, Advanced LIGO and Virgo could run for five years at design sensitivity and not see anything! That would only mean the rate of astrophysical events is very low. This would be perfectly consistent with observations from GRBs, population studies, etc...no textbooks would have to be re-written. Numbers being bandied before the press release: Black holes' 36 and 29 solar masses inspiraling to a 62 solar mass combined (Kerr!) black hole plus 3 solar masses of gravitational waves. Supernova total energy output is (1 - 2)×10^44 joules including neutrinos. It was bright, and with tremendous radiated power. I try again: "they don't have nothing to do" Don't you mean they have nothing to do? I don't think there's a good figure that tells the whole story, but if you look at Fig 5 of http://arxiv.org/abs/1111.7314, the "realistic" expected rates for compact-object mergers (dashed black line, for BNS, NSBH, and BBH) are about two orders of magnitude below the most recent upper limits (from 2009-10). This latest observing run is maybe something like 10x more sensitive than the previous data we collected, in surveyed time-volume. (Still not sure what the exact number is, the data are still being analyzed.) So, we did not expect to probe the median expected rates...and the true rate could in fact be much lower. This is why I think it's wrong to imply that a non-detection in the first run would mean we've gotten something wrong. Sorry my plot on twitter wasn't clear, it was sort of designed for internal consumption. ;) The error bars correspond to the range of expected rates (the blue region in Fig 5 from the paper above, for BNS systems). There is some overlap with >1 detected BNS event in the first run but this is quite optimistic! It's called a colloquial double negative. No, I don't have no intention to change it. Oh, of course I was exaggerating with the "terribly wrong" - sorry... Maybe I should have better said we would have gotten increasingly worried for some time and then convinced ourselves that we never expected anything else to begin with ;) Thanks for the clarification! OK, apparently you mean to say that they do have something to do etc. I just told you it's a rather common colloquial use of the double negative, I even gave you a link just in case. If you can't live with sloppy grammar, better stop reading comment sections. So...say you set as a goal the creation of a "gravitational wave telescope". I could see the pixels of such a sensor being comprised of extreme-precision atomic clocks. But would lensing be possible? Can anything "focus" gravitational waves (e.g. clever mass or acceleration design)? Excellent and simple to understand. A quick question: The simple comparison of spin to rotation here: number of rotation to bring back onto itself. Very effective. The question is how to fit this for spin half (of fermions) in this simple picture? Gravitational wave were foreseen by H. Poincaré in his seminal paper about relativity where he generalized his principle of relativity to all forces. Gravity force consists of propagating waves (very weak part) and time-dependent quasi-instant force like 1/R(t)^2 (very strong force between near moving bodies). Does LIGO make a distinction between them? is an open question, although I doubt it. But there is a lot of literature on teh subject. Generally, you need 1/s full rotations to bring an object back onto itself, where s is the spin (the exception is spin zero). Ie, for a spin 1/2 object you need two full rotations. Herzlichen Glückwunsch zu einem gut geschriebenen Artikel. Es ist übersichtlich , klar und zugänglich für ein großes Publikum. When "gravitational waves are a disturbance of space-time itself", how can you measure that disturbance with an instrument, that is "in" space-time? ** Does the wavelength reach as short as the length of my body? ** Would I experience any inertial effects as the shortest waves pass through me? ** Would my body be 'stretched' & 'squeezed' sufficiently to damage me? Can you say more about the 'new layer of reality' - I understand this in analogy to early telescopes that led to more powerful telescopes and so allowed us to see further. LIGO is the start of a new technology to let us see ... what? What is the analogy to 'further'? Not literally further, right? So different properties of cosmological objects? Or is the thought rather different: that improved resolution will reveal quantum deviations from classical predictions? (Or perhaps those are the same - and gravitational wave detectors promise data on quantum effects in black holes say?) I take your point to be that it is the future that makes this really exciting - but what do people hope for in that future? You can measure a change in space-time by comparing the cases with and without the disturbance. This is for example how you measure the light deflection on the sun due to general relativity. You measure the position the star appears when the light passes close by the sun and compare it with the position you measure when the sun is not in the way. Then you compare them. It is in this comparison that you can read off that something must have been affecting the way that light traveled. 'Further' I think isn't really the right word, because we have never made any such measurement. It's an entirely new type of observable. Gravitational waves carry additional information that is not contained in the visible spectrum. It's like you have suddenly developed a new sense that lets you study objects in a completely different way. Now as to exactly what you can study with it, I think much of this we will learn in the doing. To begin with there are the black holes of course. More interesting for me are actually the primordial gravitational waves, the ones that BICEP did not manage to find, but I am sure one days we'll manage to sift out this signal. As to quantum gravity - these are classical gravitational waves, they can't directly test the quantum gravity regime. There is however generally the benefit of exploring new parameter spaces that can bring new information. In this case it's deviations from general relativity (for example black hole hair or cosmic strings) that are interesting from a fundamental pov. Probably people will come up with more tests in the soon future.
" I have no clue how sensitive the human body is to deformation"
Another layman's question: so gravitational waves are so weak that there couldn't be EVER a spacetime "earthquake" no matter how strong thw source of the disturbance and how close we are to the merger? And while we're here a "stupid layman" question - does the intensity of the wave decrease with the distance? Yes, the intensity decreases with the distance - that's a purely geometrical effect and has very little to do with the type of wave. For what the spacetime "earthquake" is concerned - it depends on what you consider a "quake"! You could reasonably argue that LIGO is out to detect exactly such a quake. It's just a very weak one. Last stupid layman question: would detection of primordial GW necessarily validate early inflation? Sabine, you wrote above: "You can measure a change in space-time by comparing the cases with and without the disturbance..."
You are reasoning as if there were another, "absolute" or "underlying" geometry independent of forces; then we could compare the force effects. But in case of gravity the geometry changes itself. Can we compare meaningfully numbers obtained in different geometries? No, this is not what I have said. I have said we compare measurements in different situations. We do explicitly *not* compare anything with some abstract underlying geometry. I don't know what you mean with your question "can we compare meaningfully numbers" - this isn't how experiment works. You calculate an observable, you measure it. In this case that's the signal which the interferometer picks up. Then you check whether the prediction fits the data - that's how it works in science. You can then go and spend the next century philosophizing around the absolute meaning of geometry and distance if you wish, but it's not something I am very interested in. > ...gravitational waves have no dipole moment (a consequence of momentum conservation). It’s instead the quadrupole emission that is leading. the spherically symmetric configurations has spin zero. That is, a spherically symmetric matter-gravity system cannot emit gravitons. If so, then how can a Schwarzschild black hole emit gravitons in the Hawking radiation? There isn't any such thing as a "validation" in physics. There are just models which fit the data better or not so good. Inflation isn't one model, but actually a large variety of different models - and these are generally thought of as incomplete approximations ("effective" models) to a more fundamental theory (ie, what the heck is the inflaton anyway?). Whatever they would detect, some inflation models would fit better, some would fit less good. Some models would be ruled out, some would remain in the game. Which models would be winners depends on exactly what they would see, notably how strong the signal is. That is to say, there is no general answer to your question. The argument for why there is no emission in a spherical deformation relies on the mechanism of generation of gravitational waves. Ie, you take the time-dependent configuration and calculate the flux to infinity using general relativity. Hawking radiation is an entirely different mechanism of generation. Thanks Sabine. I expected that answer but wanted to hear an expert opinion. Thanks again. Three solar masses worth of energy released in of the order of 100 milliseconds(?) in a volume of size extent a few hundred kilometers - what a display of fireworks! LIGO confirms gravitational wave detection. "The 0.007-second delay between the signals in Louisiana and Washington is the right timing for a light-speed wave zipping across both detectors." Kip Thorne was asked today whether LIGO could confirm the existence of gravitons. His answer was negative, although he pointed out that LIGO was able to set an upper limit on the graviton mass (which, according to him, is about 10 ^ -55 grams). What is your take on this question? Can LIGO provide any experimental signature of quantum gravity? I guess one can also see that the idea one can detect deformation of spacetime even though one is in spacetime must be true if we can see redshift in galaxies due to the expanding universe. Otherwise, if the speed of light also changed with the size of spacetime, and the change in distances weren't detectable, there'd be no redshift. In that sense, LIGO is really only the second time we've become able to detect spacetime deformation/warping/changes. But it allows a whole new set of observations. LIGO looks an awful lot like a souped up Michelson-Morley apparatus. Is this our first positive evidence for the existence of the luminiferous ether? If nothing else, Michelson, who was never very invested in theoretical issues, would have been pleased. Hi Sabine, thank you for taking the time to write this article and the continuing discussion. I was hoping you could comment on the connection between gravitational waves and gravitational quanta. From what I gather, the observation of gravitational waves at LIGO do not really tell us anything about the existence or properties of gravitons. Why should this be the case? Can we not draw any analogs from the electromagnetic case, should we not see these observed gravitational waves as being a collection of gravitons at various wavelengths? Is there no gravitational photoelectric effect we might probe once we understand where to look for these waves? I have two other more direct questions if you have time. First, when doing the calculations that helped LIGO determine the right region of phase space to look for gravitational waves, are they using a linearized gravity model, or are these waves truly dropping out of Einstein's equations without any weak field approximation? Second, does the model predict any sort of redshift from the Hubble expansion for these waves? As you mentioned these are waves in spacetime itself, so it's not obvious whether that means they somehow transcend being red shifted by expansion. Hundreds of millions of years ago, a primitive form of life crawled out of the water on planet Earth and opened their eyes to see, for the first time, the light of the stars. Then it saw something to eat, ate it and crawled back into the ocean. thanks for the post, the explanations and all. Also, congratulations to the teams who did this for many decades a work as I understand (to begin with those who read this blog). I always thought the reason a quadrupole was the lowest moment for gravitational waves was because gravity was a strictly attractive force as opposed to em which can be attractive and repulsive? concerning the gravitational waves. How was the resulting energy equivalent to 3 solar masses calculated or predicted given the 29 and 36 solar masses of the initial 2 black holes ? I don't know. I also stumbled over these numbers yesterday, but I couldn't download the paper because the server was jammed. The brief answer to your question is probably not. The longer answer is that new data always holds the promise of providing new information that might lead to a breakthrough. In every inspiral depiction I've seen there a 2-D flat emission like surface ripples on water. Is it 2-D, 1/r decay with distance, and favored directions of amplitude or 3-D, 1/r^2 decay with distance, and isotropic distribution of amplitude? This establishes black holes exist as such. Certainly external to their event horizons, black holes are described by relativity. The ring down after fusion was also by the book. As the surface area of the fusion product versus those of its summed components decreases until it is properly spherical, where does the extra information go? The measured quantity ("strain") is amplitude, rather than intensity. So in 3D it falls off as 1/r, rather than 1/r^2. This is a key difference between GW and EM astronomy. This is why it is compared to sound rather than vision, as we get coherent phase information, and measure the amplitude rather than intensity. By improving sensitivity by a factor of x, the volume of space one can 'hear' increases by x^3 (rather than x^(3/2)). In the main frequency band Adv LIGO is 4-5 times more sensitive than its predecessor, so can sample of volume of 64-125 times greater. This is one reason why Adv LIGO first heard a source 1.3 billion light years away. Btw in case any journalist is reading this, I am surprised there is no interview of Russell Hulse or Joe Taylor on this discovery. Ok, so a gravitational wave expands & compresses the length of one of the LIGO arms, say X %. So why isn't the photon wavelength expanded & compressed by exactly the same X%, thereby resulting in a null signal? Expansion of space creates cosmological red shift: photon wavelength increases. The gravitational wave also expands space momentarily -- why doesn't the photon wavelength increase by the same mechanism caused by cosmological expansion of space? The point is that the two arms are not expanded and compressed at the same time. The interferometer measures the way two orthogonal directions behave differently. A gravitational wave is not an isotropic expansion/compression. See eg this gif. This is probably me being stupid, but what I think Unknown is saying is that if the cosmological red-shift is caused by the stretching of photon wavelengths due to the stretching of space, then there should be no net measurable interference effect, regardless of the timing between the arms -since the number of waves in a given amount of space remains constant both in expansion and contraction. This assumes that the interferometer itself is stretching and shrinking along with the space and the photons, which is probably not true, however. Bunn & Hogg have argued that the expansion (or contraction) of space has no effect on photons and that the cosmological redshift is just a relativistic doppler effect. That interpretation might answer Unknown's question - if true. On the other hand, maybe the answer is that photons do stretch and compress with the underlying space, but the endpoints of the interferometer do not, being bound by stronger forces than the spacial expansion/contraction effects. The NSF presentation (thanks very much for the link) talked in terms of the cosmological red-shift being caused by wavelength stretching so that seems to be the more popular explanation. Isn't the difference that in cosmic expansion new space is created between any two points in space, so there is no stretching in this case, where as gravitational waves are indeed a propagating sequence of expansions and contractions? Layman questions -- all waves need something to play the role of a restoring force. As I understand it, even EM waves do it in a cheating kind of way with perpendicular electric and magnetic waves bootstrapping each other according to Maxwell's equations. What does it for gravitational waves? I studied a bit of GR at undergraduate level, so I've heard of the stress-energy tensor. Can it be the traveling gravitational energy itself which distorts space according to its mass equivalent? And why does the propagation speed just happen to be the same as for EM waves which depend on the permittivity and permeability of space? Also, why the 1/r dependence instead of 1/r^2 (I vaguely get the difference for nearfield and far field in EM). What is the upper limit of the contribution to the average density of the universe from the energy of gravitational waves? Arun. This is very small (<10^-5). The limit comes from BBN. If all mass generates gravity waves, and there's lots of black hole mergers, then surely spacetime is like the ocean. How does the waves of two merging black holes make it all the way here without being cut by waves from other mergers? Sabine says "Please see the references Shantanu mentions above, they explain it in much detail. I don't know how 'bootstrapping a restoring force' is of any use. There's an equation, it has solutions, these solutions describe waves. What else do you need?" I thought his question about the speed of light was interesting. I mean, another complication in the same theme would be that the reason galaxies are supposed to be able to recede faster than the speed of light is because the speed of light does not apply when it's 'of spacetime' rather than 'in spacetime'. Or is that one easily cleared up? The masses of the two black holes in the system are estimated using the first, "inspiral" portion of the waveform. The frequency evolution of this portion of the waveform, as the BHs orbit each other and move closer together, is determined by their individual masses. The mass of the final black hole is estimated using the second part of the waveform, following the peak in amplitude. This is the "merger-ringdown" portion of the signal and is completely described as a perturbed Kerr black hole with a given mass and spin. From this we find 36 + 29 --> 62, leaving 3 solar masses left over. These 3 solar masses lost in the interaction are in good agreement with the GR prediction for the amount of energy radiated into GWs from a system of this kind. Very seldom, but still I have found gravitational waves referred to as gravitational radiation. In my - limited - understanding that synonym doesn't hold at this point: gravitational waves are distortions of space time that have been detected by LIGO, confirming theory. Gravitons though have not been detected and therefore are still theoretical (and not within general relativity either of course). Am I right in believing that as long as gravitons have not yet been found/confirmed we can't speak of gravitational radiation? Or am I missing something fundamental here? Dan - thanks, I had totally lost track of this. Gravitational waves are small perturbations in the background that is space-time. The background is still there. The perturbations and the background can behave differently. The speed of the perturbations is bounded by the speed of light, the expansion of the background is an entirely different thing. hi sabine, why does the gravitational wave not stretch the laser photon wavelength as happens with the universal expansion of spacetime? Thank you Dan Hoak, for your clear comment. A question (for you and Sabine) :so it is established that the difference is 3 solar masses, expelled in the form of gravitational waves, as energy. But could it be that the merger caused the waves without having the black holes lost any mass ? Meaning that the resultng BH still has 65 solar masses, indicating that the caused energy waves has a kinetic cause. Dropping a pebble in water causes outwardly directed energy (the concentric wave) but changes nothing to the pebble itself. Say 2 pebbles ( black holes) were to merge and the resulting pebble has a stronger gravitational field, couldn't that be the pure cause of the waves ? Leaving E = mc2 invariant, a pure addition. If you don't ask you don't know,). Dan Hoak said: "From this we find 36 + 29 --> 62, leaving 3 solar masses left over."